Vermont Corridor Apartments. 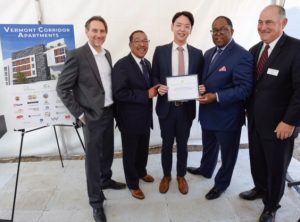 Courtesy of Meta Housing Corp.
A 72-unit affordable apartment complex is now under construction in Koreatown with a feature that local residents have long been clamoring for – a community center and YMCA. The $51.4 million Vermont Corridor Apartments will provide affordable apartments for seniors and other vulnerable members of the community, as well as a 12,500 square-foot YMCA. Several of the units will come with supportive services and subsidized rents for residents who had experienced homelessness. Slated to open in March 2021, the project is being developed by Meta Housing Corporation in a joint venture partnership with Western Community Housing. The County of Los Angeles’ Measure H will pay for supportive services at the site, while the City of Los Angeles’ Proposition HHH will account for a significant portion of the construction cost. Other funding sources include the Housing Authority of the City of Los Angeles (HACLA), the Los Angeles Housing and Community Investment Department (HCID), the Community Development Commission/Housing Authority of the County of Los Angeles (CDC/HACoLA). Aaron Mandel, Executive Vice President of Meta Housing, said the new development repurposes an underutilized County property to provide a high quality and safe environment for residents at an affordable cost while reducing blight in the area. The development will also generate an estimated 321 construction jobs and seven permanent jobs. Monique King-Viehland, Executive Director of the Community Development Commission/Housing Authority of the County of Los Angeles, said, “We look forward to the future of the Vermont Corridor Apartments and its position in the community – a hub that will provide affordable homes for seniors and special needs residents. The addition of the YMCA on the first floor will help to enhance the neighborhood through their commitment to meeting community needs through a strong range of programs. The 113,061 square-foot apartment community will be constructed to LEED Gold standards and is located 3 blocks from the Metro Purple Line’s Wilshire/Vermont station with many other amenities including a grocery store, a pharmacy and medical clinic, public schools, stores and restaurants, and a library in close proximity. The development is also less than a quarter mile from Shatto Recreation Center, which comprises sports fields, facilities for community events. 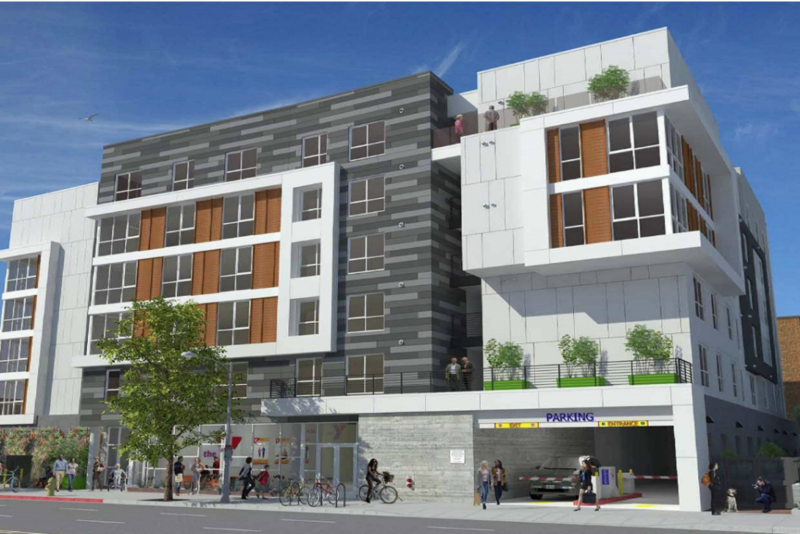 The apartment community is one of three projects planned for the Vermont Corridor in Koreatown, specifically on Vermont Avenue, between 4th and 6th Streets. Also under construction is the 21-story Vermont Corridor Administration Building, which will be the new headquarters of the County Department of Mental Health, as well as Workforce Development, Aging and Community Services. Another project will feature market-rate housing.